Facial Hair Style: He has worn a light beard for the past few months. He does not like to grow a full beard. Unshaven and unkempt, Cynric is in his mid-twenties, although his beard makes him appear older. He has blue eyes and well defined facial features might be considered attractive by some, in a rough, savage kind of way. Most likely, though, Cynric's unkempt, barbaric appearance is typical of a tribal warrior and makes him an odd sight civilised lands. The warrior is tall and muscular, although less so on both respects compared to the stereotypical northman. He wears his hair long, although he sometimes hides it beneath headgear or ties it into a braid before battle. 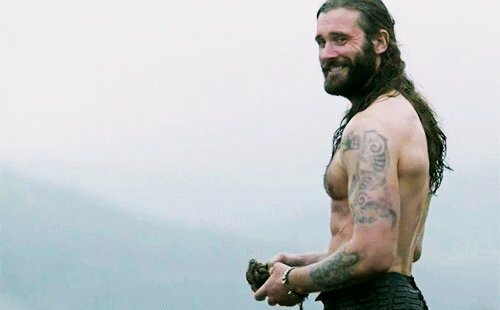 His body bears the scars of battle, and a number of tribal tattoos, many of which are the work of the past two years, honouring as they do the traditions of the Greyfox, Battlesong, Foecleaver and Blackfeather tribes, the remains of which have fought under his leadership. Some among the tribe whisper there is magic to the tattoos, something that Cynric does not deny. While once, Cynric's sarcastic smile was never far from his lips, now his smile is more one of whimsy, like he is constantly privy to some private joke. This is unless anger takes him, when he can grow exceedingly serious exceedingly quickly. He speaks with an accent strongly influenced by Illuskan, that sometimes makes him sound rather stupid. Cynric commonly wears a fine suit of chainmail which is underpinned by cured dragonhide, taken from a Black Dragon he led the Greyfox in battle against. In battle this supplemented by a fine helmet with gold decoration, a rather grand thing denoting his status as chief. A white wolf skin hangs about his shoulders, a gift from a Shaman of the tribe before she passed away. By way of arms, a battleaxe hangs from Cynric's side, and he alternatively fights with a round shield or a large towershield of wood, both painted in the style of the barbarians of the north. His chief weapon is, however, a long axe that is always on his person, either strapped to his back or in his hands. All Cynric's arms are well maintained but the long axe is kept flawlessly sharp and clean. Always ready with a wide grin, Cynric is vivacious and boisterous, moreso than a typical barbarian warrior. In the past he has not been quite spiritual or driven enough for many Greyfox, his mirthful flippancy no act. In recent years this has changed, however, and upon being acclaimed chief of the Greyfox, winning the love of Nerys the Emissary, fathering children and leading the united tribes in battle the warrior has grown committed to his responsibilities to the tribe, and his flippancy is now an act, designed to invite and reveal the thoughts of others. As he often says, Greyfox lurk in the Morning Mist. Although a nomadic barbarian with little in common with city dwellers, Cynric is not opposed to speaking with them and although he is quick to point out what he sees as their inadequacies, he recognises competence when he sees it. Cynric is always ready for a fight but does not see battle against the weak or innocent as being worthy. In fact, he is now of the belief that those who cannot defend themselves should be protected, both within and outside the tribe. He favours the role of Shaundakul in being a helping hand to travellers. When the circumstances demand it, Cynric can move in deadly earnest, despite the otherwise unfocused and dismissive nature he displays, and against foes he can be brutally savage as one would expect from a barbarian warrior. Orcs, particularly, arouse his ire, and only one or two orcs have ever met anything from him but swift violence. Once upon a time, lurking underneath Cynric's cocksure outlook was melancholy at his own prior weakness and the loss of his siblings and the tribe. His efforts to set things right, and the love accorded him by both his wives, have given rise to a personality committed to the well-being of the Greyfox and his comrades, and, consequently, a burgeoning self respect. The remnants of Cynric's former self indulgence still exist in his strong commitment to personal freedom. General Health: A nomad who lives under the stars, he is fit although perhaps sometimes has dirt under his nails. He is hardy. Profession: Chief of the Greyfox, Son of Rigo, Spirit-Touched Warrior, Feysire, Chief in the Mists, Laughter on the Wind, Tent-mate of Nerys the Skald, Skullsplitter, Helldrinker, Trollkiller, Faster than Lorsa and Stronger than Eslax, Wooer of the Healing One, Slayer of Dragons, Seeker of the Salt Shaman, Taunter of Devils, Hunter of the Wild Hunt, Climber of Mountains, the One who Brought the Tribes Together. Only one of these "titles" is used at a time! The main goal is to confuse listeners. Habits/Hobbies: Cynric is active, he does not like “putting down roots”. He also seeks to do what he can for his tribe, and to better himself to be better able to protect its members, and to be seen to do so so as to inspire the other warriors. As such he spends much time hunting, either for furs to sell, or to battle hostile monsters. Cynric is fond of making jokes, and enjoys hearing them as well. His jokes tend to be a bit left of centre, however. He also gives impromptu nicknames to friends and companions, which are not always complimentary. Cynric takes his role chief of the tribe seriously. He is doing what he can to create a positive impression among the southerners and so spends time assisting those who are worthy and also learning of their customs. However, he is sensitive to him or the tribe being patronised and is conscious that part of his role as chief is to ensure that the Greyfox are treated with respect. Cynric keeps his father’s greataxe sharp at all times, and can often be seen to sharpen it before matters of great import, or indeed when he is worried about something. He has a tendency to wash himself more than the average nomadic barbarian. This is a trait that developed in the years the tribe was camped in the bluff above Ulgoth's Beard. He is still mucky compared to a civilised man, however. Cynric has an eye for women, although what he finds attractive is strength of character and sense of humour as much as looks. While he might express admiration, he seems content in his existing relations. He is, in fact, instead looking for partners for his tribe's warriors, and his overtures are not dissimilar to when he asks strong warriors to join the tribe. He has been learning to read, being taught by Nerys the Skald, but his command of the written word is still very poor. Languages: Common, Illuskan, Sylvan. A smattering of orcish learnt to taunt the beasts in battle. Weapon of Choice: Greataxe (the axe of his father, Rigo) and his physicality. Spirit Animal: A Mountain Goat. When Cynric found his spirit animal as a youth it was a goat. Goats are clever animals, unconventionally stubborn and capable of traversing very difficult ground. It is an animal he now thinks fits him. The Goat follows Cynric wherever he goes. Generally it pays little attention to what occurs, and absently grazes on phantom grass behind him. In moments of significance, however, it will pay close attention, and even try and interact with nearby Shaman to pass on what wisdom it holds. In such circumstances it can be quite insistent, starting quite intently. Cynric is the third son of Rigo Greyfox, a strong warrior of the previous generation. Rigo lived a full life, and between battles he married the shieldmaiden Irala Greyfox, fathering first two sons, Lorsa in 1320 and Eslax in 1324, then a daughter Barila 1326, and finally Cynric himself in 1327. In 1340,when Cynric was in his early teens, Rigo was slain in the battle to slay a mighty ogre chief which had been plaguing the tribe, and passed on. Lorsa, already twenty and a young warrior who had fought by his father’s side, became Cynric’s role model. The three brothers, Lorsa, Eslax and Cynric, were close: Lorsa, the great warrior, Eslax, a cunning hunter and scout, and Cynric, also a warrior but very much in his brothers’ shadows even when he came on age in 1345. The trio roamed as warriors of the Greyfox, always however at Lorsa’s instigation, slaying beasts that might threaten the tribe and battling hostile tribes. Both Lorsa and Eslax began to win some of their father’s renown, Cynric happy to be along for the ride, happy to be known for his sense of humour and little else – something which was noted upon. Of all Rigo’s children, Cynric achieved the least, as Barila had found her way on the path of the shaman. He was always thought to be immature, an overgrown child of sorts. Some of the elders would shake their head, seeing wasted promise in the youth, despite the noble examples he had in his brothers. Then the orcs came, and all the Greyfox were pressed hard during their migration. The brothers did their part, engaging in battle with orcish raiding parties while the sick and old were moved. Alas, in 1348, the trio were part of a group that was ambushed by black orcs and suffered great losses. The three brothers, battered and wounded, were among the few survivors, and attempted to flee back to the main body of the Greyfox tribe. More black orcs found them, death would surely have followed had Eslax not decided to lead them off with his wood craft. He was successful, in part, with the main pack going after him, but unfortunately others detected the remaining retreating warriors as they attempted to hide in a craggy upland area. The ensuring battle, with the Greyfox warriors with their backs to a cliff edge, was brutal and bloody. Cynric was beaten down by a snarling orcish champion, his shield broken and the bones of his arm shattered. He lay in agony as he heard the clash of steel and brutal orcish blades and the death screams of his comrades. His doom was upon him, until Lorsa, having dispatched the last of the lesser orcs in a great feat of skill, hammered into the champion, the momentum carrying them both over to a bone-crunching end on the sharp rocks below. All that remained was to raise a cairn for the fallen warrior and retrieve his father’s axe. Only Cynric survived to return to the Greyfox, one brother dead and the other missing in the wilds. For a long while, his mood was sullen and dour, and the eyes of other Greyfox rested upon him with suspicion as a possible coward. Nevertheless he fought the orcs with all his might when required, but it was a war that the Greyfox were losing. As the tribe fell on hard times, many fell in battle and others of sickness and privation, including the now ageing mother, throwing the young warrior deep into gloom. However, this time for some reason the grief passed: the old Cynric returned, boisterous and brash, yet there was something different. Where once he had merely followed his brothers, Cynric now was determined to act. The Greyfox tribe must survive, or his brothers’ sacrifices will have been for nothing - Cynric should have died in Lorsa’s place, in his mind, and so he owed it to Lorsa and his mother to not sit idle. Yet, his new demeanour was not enough to halt the calamities facing the Greyfox. Cynric was out searching for the missing Eslax, refusing to give up hope, when the Black Orcs finally scattered the rest of the tribe. Coming upon the hastily abandoned camp again, he discovered blood and shattered trinkets in his sister’s flattened tent, and she was nowehere to be found, the same being true of the others. Despite searching, Cynric was driven off by orcs, and after a hard journey, arrived in civilised lands and came south, following rumours of both other Greyfox survivors and of other groups which were prepared to battle the black orcs. He has upon arriving attempted to look for both his sister and brother but he is coming to terms with the fact that their survival is unlikely. After arrival in the Baldur’s Gate region Cynric reunited with other Greyfox survivors. The reunited tribesmen, many of them young and inexperienced, struggled to find their way in the southern lands at first. Unusually for Cynric, he stepped up to the plate in aiding his people and was vocal about needing to find a place alongside the southerners but without joining them and after proving himself in battle, he was acclaimed chief by the others. In truth him and Nerys formed a partnership, with her acting as the tribe's emissary to help them make the necessary links to survive in the south. This partnership grew closer, unsurprising on Cynric's part perhaps as much of his initial change in behaviour had been inspired by Nerys herself. Together they gathered a band of tribesmen on the bluff above the village of Ulgoth's Beard, and found a place for the Greyfox there, bringing an end to the tradition of raiding and instead bartering the service of Greyfox warriors in protecting travelling caravans in return for luxury goods. In this way honouring both Shaundakul and Tempos. The Greyfox hosted visitors and befriended southerners such as the Silver Rose Tribe. There was some personal strife when, after Nerys struck down a man taunting her near the Friendly Arm Inn, the Order of the Radiant Heart investigated the incident. One of the investigators, Layana Mordiggian, met Nerys and the pair fell for her. No promises had passed between Cynric and Nerys, and in Greyfox culture polygamous relationships are common, but for reasons Cynric did not make clear the chief took exception to the new arrangement. Yet the potential for strife was brought to an end when Cynric came to know and admire Layana himself, terming her the "Healing One", and the trio then formed a stable and affectionate tent group. They even took on a child whose dying mother stumbled on the camp. She was named Faldorn, her future fate that of a druid. The tribe's fortunes began to rise when, upon travelling north to Secomber, they undertook a mission for Trasker Selarn to venture into a lizardfolk dominated temple. There they battled a lizard king and his black dragon, the scales of which formed Cynric's new armour. In return Trasker agreed friendship helped gather some of the Greyfox who had fled north, rather than south. Cynric was overjoyed that one of those new arrivals was his Sister Barilla. The tribe, growing in number, moved its camp down the Chionthar and began to flourish, with youths being trained in battle against the orcs of the Sharpteeth and more scattered warriors arriving. A fey spirit, Lumina, joined the tribe and blessed the Healing One, Layana, with a litter of fey touched daughters for her, Nerys and Cynric. It was then that a request came from other tribes who had survived the Black Orc war to meet. A great parlay was held in the Greyfox camp, attended by Yngir chief of the Battlesong, Broli chief of the Blackfeather and Gorkar chief of the Foecleaver. They were welcomed by Cynric, flanked by his wives Nerys the Emissary and the Healing One, Layana. Shamans of the coven Lida and Karth were present, as was Kahl and the other assembled Greyfox warrriors. The Greyfox heard out the proposals of the other three tribes, who had formed a confederation to drive back the orcs on the northern High Moor. An invitation was made for the Greyfox to join this alliance, and as it was mulled over the camp came under attack from Unseelie Fey in the form of the Wild Hunt, who demanded that Faldorn be turned over to them - the purpose for which they had been summoned by some nefarious party. When the united warriors fought off the hounds of the hunt, the Fey Herna was impressed enough with the tribesmen's prowess that she offered a duel to Cynric for Faldorn's fate. Cynric accepted, and although he was wounded, he bested her. In accordance with the laws of the Fey, Herna honoured her word and returned form whence she came. The duel against Herna won the respect of the other chiefs and now they offered to make Cynric their chief too, merging the tribes into a single Greyfox tribe once more, a group that would have sufficient strength to survive. The Greyfox accepted this offer, and in 1350 decamped to the northern High Moor near Secomber, renewing relations with Trasker Selarn. There, as the young warriors were trained, the war against the orcs and goblins of the High Moor continued and the tribe won honour and spoils in raids and the protection of caravans. In the years since Cynric has focused on leading the united warriors and encouraging them to fight together, while Nerys and the Coven safeguard and teach Greyfox traditions. Gradually, Cynric has been relying more and more on Yngir, Broli and Gorkar to lead the warriors, particularly Gorkar who is a mighty warrior. Similarly he has raised up a Foecleaver to champion of the tribe. He does not want the unity of the tribe to be dependent on his personality alone and so he encourages all to learn to rely on each other going on occaisional walkabouts, for a tenday or a month at a time, giving another a chance to lead for a period until he returns. Meanwhile, the Greyfox themselves did not forget their friends in the south who had helped them in hard times. With Cynric's agreement (he wouldn't dare disagree!) Nerys and Layana arranged for the tribe to gather and send healing herbs during the plague of Baldur's Gate in 1351, and Greyfox Warriors fought the Blight during the siege under Nerys' leadership during 1352. After the war, the Greyfox tribe took in a number of orphans willingly, with Layana aiding them to integrate into with the tribe. Cynric, always warm with children, has done his best to ease the children's entry to the tribe. It was on a walkabout in 1351 that Cynric met the Salt Shaman, Charraj, and aided him in his trip to Avernus. Charraj, however, did not return, disappearing into the fires to find a way to close the portal, an honourable act of atonement. Cynric has since felt guilt at not having aided Charraj more, and has searched for the mage since to no avail. Finally, restless on this, he has come back on another walkabout to seek southern shamans to aid a more thorough search - if necessary through the portal itself! - Vengeance upon the Black Orcs, and orcs in general. Ongoing. This is a lifetime's work for the whole tribe, but not more important than survival. - Repopulate the tribe. Ongoing. 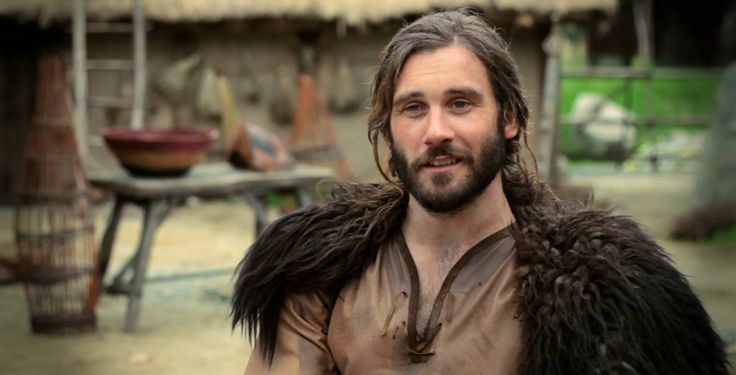 Orphans, other tribes and new births have brought new blood but Cynric is always on the look out for new tribespeople and potential spearwives and husbands for his warriors. - Live up to the examples set by past chiefs and impress the coven, and the rest of the tribe, to keep it stable. Ongoing. Good progress has been made on this but a constant roll of great deeds is needed for Cynric to ensure he continues to inspire the tribe. - Find the Salt Shaman. Ongoing. Cynric searches for aid. - Take more responsibility for himself and the tribe now Lorsa is dead and his other siblings are missing. Complete. - Find Barila. Complete! A happy ending. - Find Eslax. Abandoned. Cynric has given up hope. - Overcome his survivor guilt. Complete. - Instill fresh purpose in the tribe. Complete. War against the orcs on the High Moor continues. - Keep the Greyfox traditions alive. Complete. The Greyfox survive, and while they have adapted, they are still Greyfox. - Find a stable, safe territory for the Greyfox to wander. The vicinity of Secomber is safe, and stable, given the close ties with Trasker and Secomber. - Bring an end to unprovoked raids by High Moor tribes. Complete. 1 – What happened to Cynric’s brother Eslax? 2 – Cynric is highly respectful and protective of spirit shamans and is attuned to the spirit world. 3 – Cynric's spirit animal often sees or sense what he doesn't. It does not communicate with him in any meaningful way, but a shaman could interact with it. 4 – Cynric's benevolence has increased over time, pre-dating his marriage to Layana Mordiggian but certainly being accelerated by it. Some of the harsher Greyfox might dislike this, hence his drive to prove himself a great warrior to carry them with him. 5 – Cynric respects a great deal people who conquer their weakness and fear. He does not despise someone who is afraid or uncertain if they do not let it impair their actions. Rather, he is inspired by those who deal with such adverse feelings positively as it gives him hope that he may do the same. 6 – He frequently splits the skulls of orcish enemies after their deaths, disfiguring them in the way his brother Lorsa was disfigured by the sharp rocks onto which he fell. 7 – He is fond of an ale – and can be irresponsible when drunk, as he may forget his guilt and also his newfound commitment. Last edited by kleomenes on Fri Jan 05, 2018 11:21 am, edited 20 times in total. Updated 07/08/17 to bring up to date, accounting for developments in 1349 and 1350, and time away from the server. This is a mostly retired character but I roll him out now and again, so I felt his biography should be reliable!